Peel and finely dice the shallot. Chop the chives. Peel the white mushrooms and cut into quarters, along with the shiitake mushrooms. Shred the oyster mushrooms. Cut the bread into small dice. Wash the spinach and gently pat dry. Heat a frying pan and add the peanut oil. Add the bread to the pan and cook until golden brown. Remove the croutons from the pan and place on kitchen towel to allow any excess oil to drain. Season with salt and pepper. For the poached eggs: bring a pan of water to the boil and add the vinegar. One by one, break the eggs into a bowl and add to the pan. Cook for 2 to 3 minutes and then remove from the pan. Heat a frying pan to hot and add a drizzle of olive oil. Add the mushrooms to the pan, season with salt and pepper and cook for a couple of minutes before adding the shallot and the chives. Remove the mushrooms from the pan and deglaze the pan with the sherry vinegar. 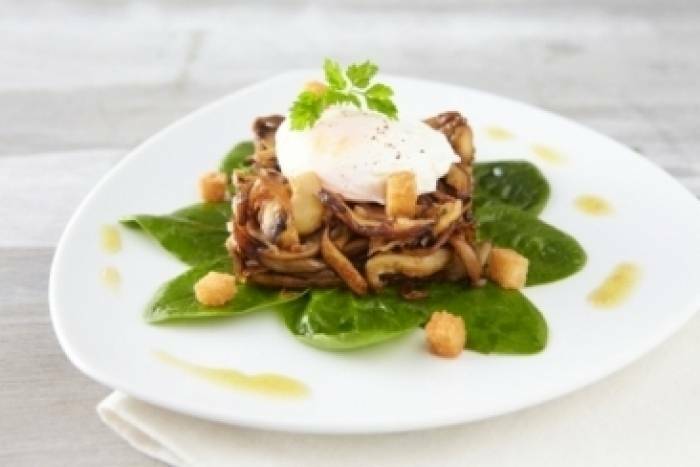 Serve the mushrooms on a bed of spinach and place a poached egg on top. Sprinkle the croutons on to the plate and add a drizzle of the warm sherry vinegar. Decorate the plate with balsamic reduction to serve.